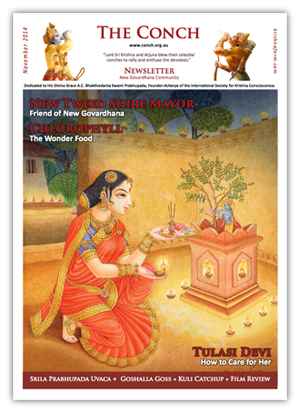 The Conch is New Govardhana community's monthly newsletter. Whether you live locally or further afield, The Conch is a great way for you to keep inspired and remain connected to the New Govardhana community. Vedic lifestyle and more .. If you haven't already done so, subscribe using the form on the right of this page and get the conch delivered to your inbox every month. Receive upcoming festival and event notifications, get the Conch Newsletter delivered each month, and be alerted about important announcements. Your donation supports our worship, community and outreach programs.